"Ne'er cast a cloot til Mey's oot"
This old Scottish saying warns not to shed any cloots (clothes) before the may flowers (hawthorn blossoms) are in full bloom. 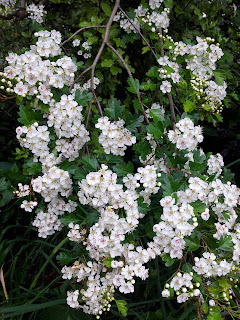 The Hawthorn tree (also known as May Tree, Mayflower, May-thorn, Quick-thorn, Mother-die, and Fairy-thorn) is in full bloom on the Otago Peninsula, smothered in white flowers with hints of pink. The tree may be broadcasting that summer is coming but in Dunedin we are not able to shed our layers of clothing yet. I have known the secret of delicious Hawthorn and Apple jelly made from the fruits called "haws" in autumn. The spicy bite of the haws with the sweetness of the apples, with a rich purple-red colour makes it a real winner. I am happy to share this recipe if you are keen to try it in autumn. I first took the photo on one of my walks and decided to find out if I could eat the flowers or leaves. I discovered that in days gone by in England it was called the bread and cheese tree. Children were given Hawthorn leaf sandwiches because it was one of the earliest nutritional green in the hungry part of the year. I tried the leaves but it was a little late now that the flowers are out. They were a little tough to chew but next year when the leaves first appear they will be a welcome addition to an early spring salad. The flowers are pretty and looking at them you can see why they belong to the rose family. Some say the flowers impart an aroma of cherries but I couldn't detect that. 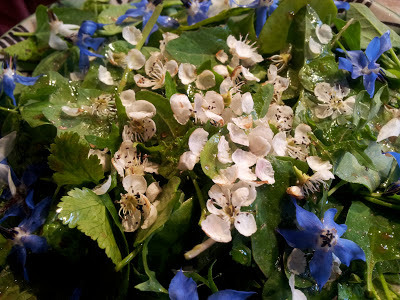 Gather green salad leaves and herbs. I used a mix of lettuce, miners lettuce, rocket, NZ spinach, parsley and coriander. Dress the greens with your favourite dressing and then add the flowers. Pretty, different and nutritious. 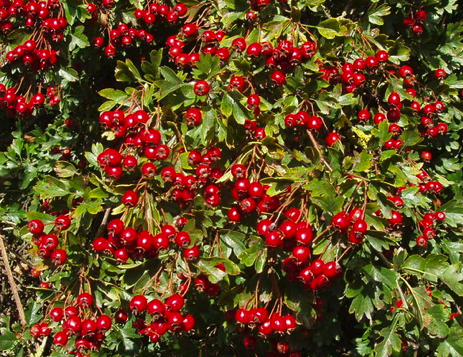 Eating the flowers and leaves of Hawthorn is a good source of antioxidants but avoid collecting them from the roadside. Hawthorn is mentioned in the folklore of many countries and cultures; Celts believed it could heal a broken heart, ancient Greeks carried its branches in wedding processions, the Serbians and Croatians believed it to be deadly to vampires and was used for the stakes needed for vampire slaying, the Gaelic Scottish and Irish believed it marked the entrance to the other world and the fairies. Its bad luck to cut its branches unless its in full flower and the flowers are still used today as a decoration for May Day celebrations. I found this most intriguing recipe from Sarah Head of the UK Herb Society and is adapted from a Hugh Fearnly-Whittingstall River Cottage Autumn recipe. Wash haws in cold water and remove stalks. Cook with vinegar and water for 45 minutes until soft. Sieve, pushing through as much of the softened material as possible. Measure liquid - to every 100ml of liquid add 100 g of honey. Put back in cleaned pot and season. Cook 5-10 minutes to produce the consistency you want. Pour into sterilised bottles and seal. You could add other spices if you liked but I will try it first with these simple ingredients. Hedgerow to Kitchen - Hawthorn. 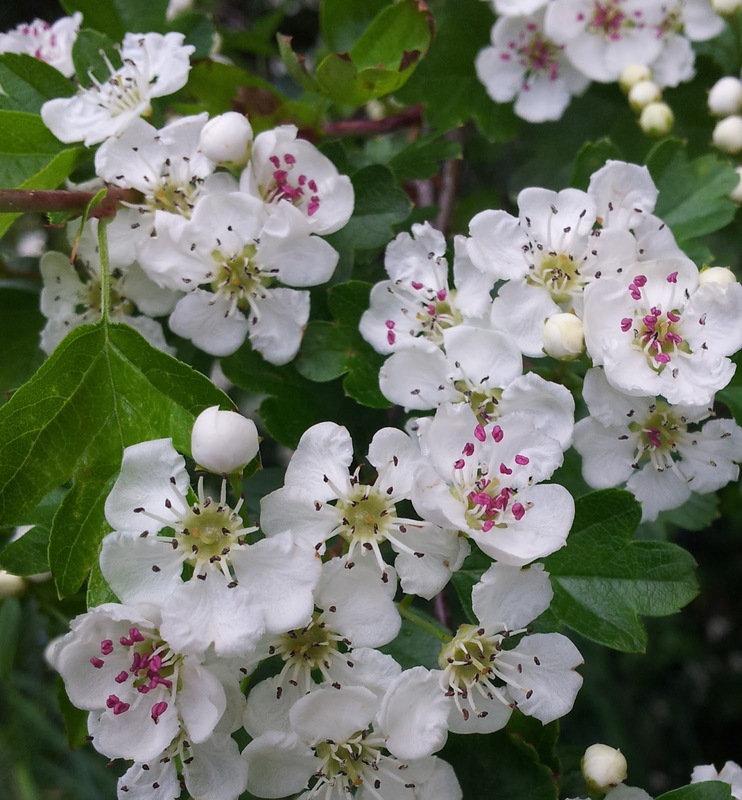 This link to the UK Herb Society will introduce you to other Hawthorn recipes including making your own Hawthorn flower tincture with vodka. I am in Auckland visiting my daughter Tansy and grandson Beau. Lucky Beau has a daily pick of strawberries growing in the garden. 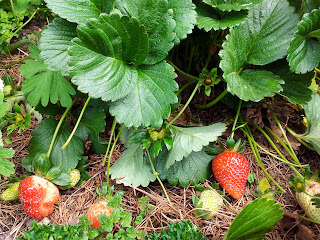 Tansy's strawberries on a bed of pine needles to keep the fruit dry. 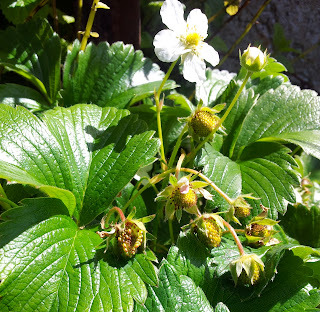 As the Hawthorn is considered to be an emblem of hope I am hoping that the blooming Hawthorn will be announcing the start of summer in the South and my strawberries will ripen. As a childI was always told to eat the ripe Haws(hawthorn berries) as they are good for the heart and assist the airways.I make a tea from the leaves drinking it first thing in the morning and last thing at , this has helped immeasurably after a major Car accident it helps control Anxiety Attacks.I use fresh young storks and leaves in salads.Make Hawsin sauce and Hawthorn jelly.Hawthorn also helps me with arthritis I developed after the car crash I use all parts of the HAWTHORN LEAVES,FLOWERS AND HAWS (BERRIES).As well as a hawthorn hedge I planted after my car crash.